Let’s not waste time. If your girl has already told you or has been strongly hinting about what she wants for Valentine’s Day, just stick to the programme. 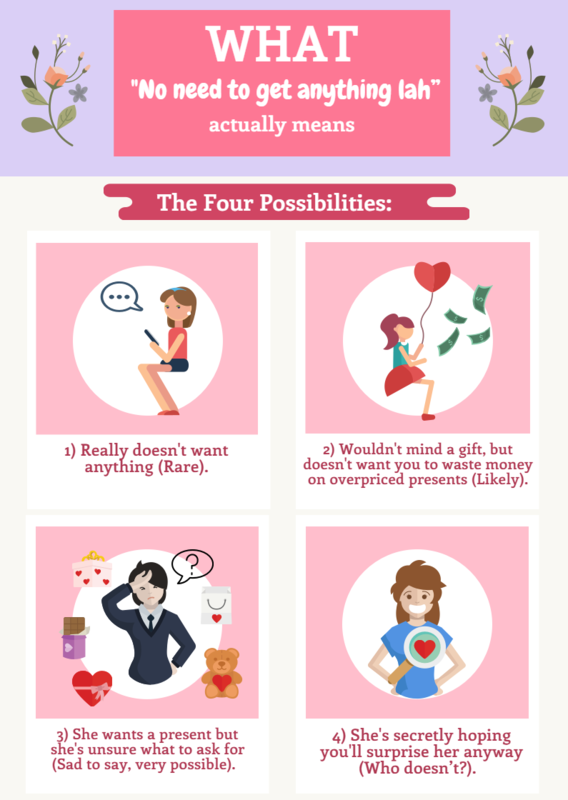 This guide is for those bros out there who have to navigate the minefield of this season blind, because their partners told them, “No need to get anything lah”. Because this is girl-speak, unfortunately, there’s no single answer. However, according to our team of experts, there are usually four reasons why your lady uttered those fateful words. 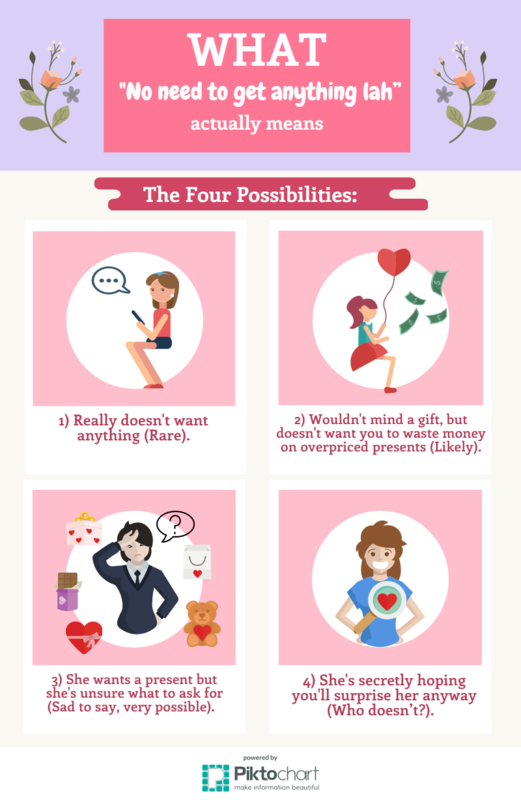 We know, number 4 in particular can be infuriating since your partner hopes you’ll read her mind or something like that. You should have a chat about it—after you get her the gift. Also, do note that some girls might be a combination of the reasons above. Like we said, girl-speak can get complicated. So what’s a poor bro to do? 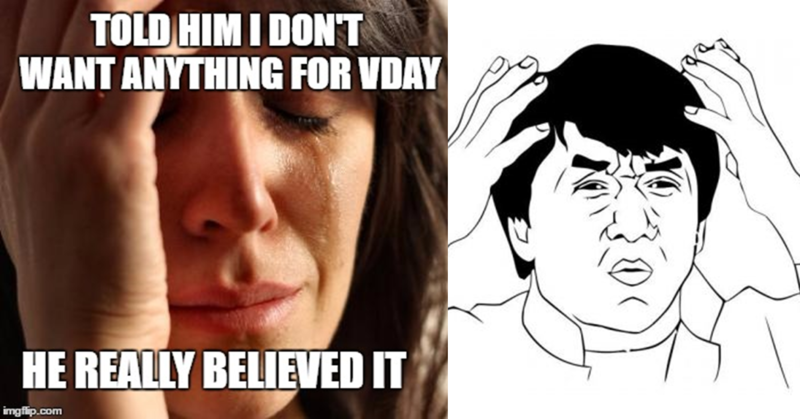 Instead of a day that’s meant to celebrate love, Valentine’s Day becomes a source of undue stress. Daily bouquet curators Happy Bunch are giving a spin to their usual bunches, just for Valentine’s Day! If you’re unfamiliar with Happy Bunch’s model, essentially, they offer curated bouquets that change daily. However, for Valentine’s Day, they’re keeping things simple with a standard 12 red roses available for delivery daily from the 10th to 16th of February (five working days). Happy Bunch have brought in 5 partners to sweeten the deal so each bouquet comes with a little something extra that changes from day to day. The combo of the bouquet and the gift is fixed at RM150, and there’s free delivery to selected areas in Klang Valley. Delivery to Cyberjaya, Putrajaya and Klang is available at RM10 per delivery. Do note that changes of gifts for different dates are strictly not allowed. 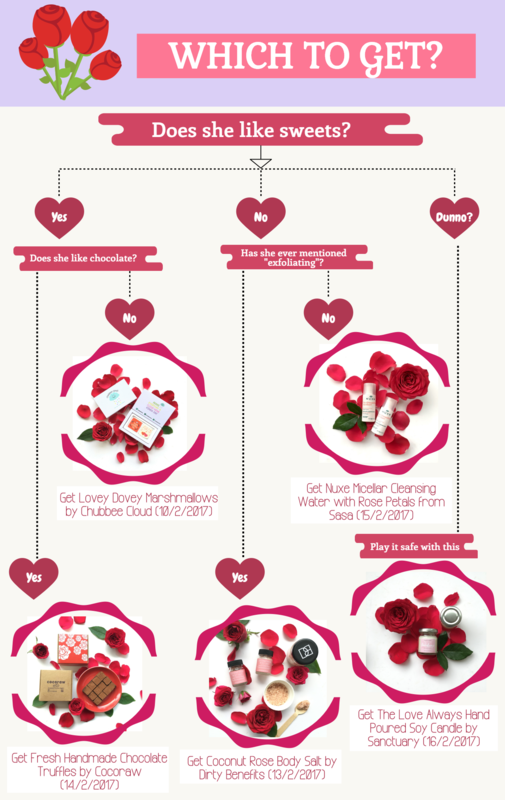 We know it’s a bit hard to decide if your girlfriend would prefer chocolates over a body scrub, so our team of girl experts have also prepared a handy flowchart just to help you decide. If you really can’t decide, you could consider splurging a little and sending her a bouquet every day. As extravagant gestures go, she’ll be the envy of her colleagues with a daily bunch of perfect red roses coupled with thoughtful gifts. We’ve partnered with Happy Bunch to offer a special promo code that’s exclusive for Vulcan Post readers. It’s limited to 100 redemptions, so you might want to jump on it fast. Enter in HBVPLOVE right before checking out for a 5% discount. The code is valid from now until 16th of February 2017. 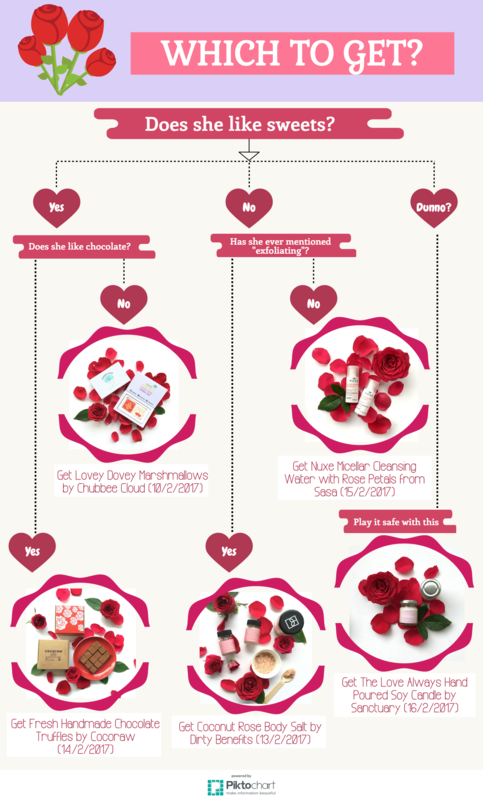 We hope this guide has been helpful to a bro or two having a headache over Valentine’s Day. May you successfully navigate the choppy waters and sail into the harbour of love. Disclaimer: If by some infinitesimally small chance your girl doesn’t like the gifts, please don’t tell her you took the advice of an online article to decide. That would be another landmine. This article was brought to you by Happy Bunch.